Monday saw a third couple sent home from “Dancing With the Stars” — and plenty of tears were shed in the process. After departing from the St. Louis Rams and the Dallas Cowboys last year, Michael Sam was voted off the ABC competition following consecutive weeks of low scores. The first openly gay player in the NFL and his dancing partner, Peta Murgatroyd, became the third casualties of Season 20. The former football star did bring tears to many an eye as he recalled his difficult childhood after being abandoned by his father. As expected U.S. Army veteran, athlete and amputee Noah Galloway shared an emotional journey as he recounted his experiences in Iraq. Galloway talked about the roadside bomb that blasted off his limbs, and of the depression that later drove him to drink when he returned to America. Rumer Willis shared how tough it was growing up as the daughter of one of the most beautiful women in the world and being called “ugly,” “buttaface” (slang for everything is attractive but her face), “Mr. Potato Head,” and being told she looked more like her dad, Bruce Willis, than mom Demi Moore (who was once again in the audience). 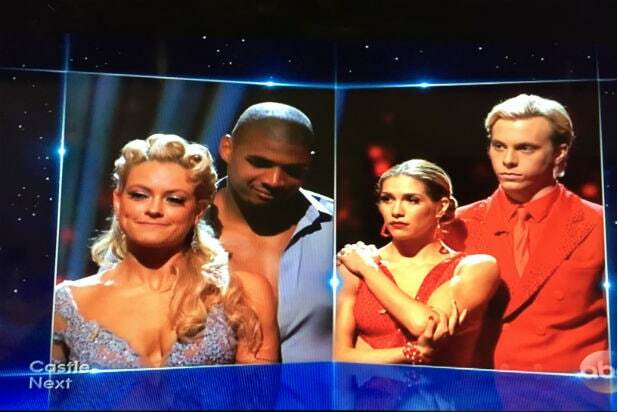 Willis with partner Val Chmerkovskiy and Nastia Liukin and Derek Hough are currently leading the pack.